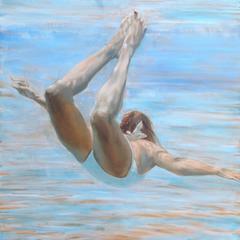 See Water is a figurative swimmer artwork. It is acrylic, oil and varnish on wood panel. Artwork is 32 x 32. 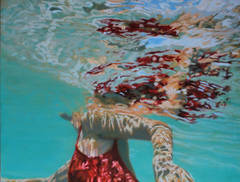 Carol Bennett spends all of her time surrounded by water, and a great deal within it. 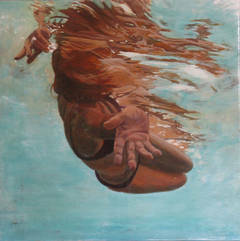 Her work is a meditative journey through both the water and through life. She is intrigued by how life continues to flow and change, being both in the moment and timeless. The viewer will experience being in a state “flow” – where the currents of the ocean suspend life and self, and the unexpected floats to the surface. Carol's work has been featured in many solo and group exhibits throughout California, New York, and Hawaii including a 2007 solo show at the First Hawaiian Center at the Contemporary Museum of Art (Honolulu) and a 2018 group show "Making Waves" exhibit at the Honolulu Museum of Art. Her work was seen alongside April Gornik, Agnes Martin, Kiki Smith, and Pat Steir (to name a few) . She has recently completed a commissioned 8' x 48' glass canopy for the Hawaii State Art Museum, Sculpture Garden. She has been featured in Hamptons Cottages & Gardens, Ocean Home Magazine and the New York Times. Carol's artwork has also been featured in Designer Showhouses in Westchester NY and the Hamptons, and is part of public and private collections around the world.